The different varieties of lettuce to choose from to grow in your home vegetable garden varies as greatly as the number of choices your local cable company or dish provider give you in the form of channels to surf through. Then when you break down each variety there are even more choices. And just when you thought you narrowed everything down, someone threw is a Mesclun mix! Yes, there are that many choices with lettuce. But don’t fear. Although you have countless choices for your lettuce, the basic process by which to grow them are for the most part , the same. Depending on which variety of lettuce you choose to plant will determine how deep you should plant the seed. As a rule of thumb the smaller the seed the closer to the surface the seed should be planted. One quarter inch to one half inch deep is the normal depth for most lettuce seeds. Expect the seeds to germinate in about fourteen days. Start your lettuce seeds indoors four weeks prior to the last frost date in your area. Lettuce is a great cool weather crop and can be grown in both the fall and spring, which makes the transition from indoors to the outdoors during the winter/spring season much easier. Lettuce likes the soil’s pH to be neutral (that is 7 on the scale). Although it will tolerate slight acidity, anything under 6.0 won’t be helpful to your lettuce`s growth. If you have been composting throughout the year with an even blend of `greens` and `browns` , your space should be ok. But pay the $3 for a pH soil tester just to make sure. Spacing, watering and sun requirements will vary from variety to variety but for generic purposes, space out your lettuce ten to twelve inches, give them a light to moderate watering (every other day or even every three days), and plant in an area that receives partial shade to full sun. When harvesting, many types of lettuce can simply have their leaves snipped off with a pair of scissors which allows the plant to continue to grow until it either stops producing or bolts due to surrounding conditions. The exception to this harvesting rule is iceberg lettuce. You will have to harvest the entire head for best results. 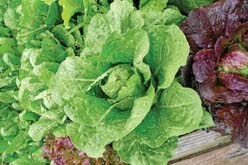 Lettuce makes a great companion for pretty much everything but does not rotate well with artichokes, endive and escarole. Now is your chance to unleash your inner passion for salads by growing your lettuce which makes up the base for many types. Plant a pack of Mesclun mix in your home vegetable garden and you will have a near complete ready made salad. When I was younger I could not stand the taste of spinach. of course that was more than likely due to the fact the only spinach my mom served came from a frozen box that had to be cooked. Then in my early twenties I grew (no pun intended) to love to eat fresh, raw spinach. That is when I began growing my own spinach. I found that this cool weather crop is a great addition to any home vegetable garden, and a lot easier to grow then you think. Spinach is a great crop of choice to start indoors. Because it is a cooler weather crop you can start it 3 weeks prior to the last frost of the winter season in your area and move it outdoors. It also makes for a great crop choice for cold frame growers. Spinach seeds are on the medium sized scale and can be planted as deep as one half inch beneath the surface. In optimal conditions spinach seeds will germinate in as little as seven days, but the normal is fourteen days. When preparing the site where your spinach will grow, make sure the pH range is in the 6.5 to 7.5 area. As long as you are using composting methods all year round, you should be ok. Pick a spot that receives full sun, and although many varieties of spinach will grow in partial shade, full sun will really give it a great boost. Spinach requires a decent amount of space. Try to space your spinach plants out at least twelve inches, and if you can spare more room for them, do so. They will repay you with great returns. Your spinach will be ready to harvest when the leaves are of big enough size to consume. Yes I know that is very generic, however, you can begin to harvest your spinach when you feel the leaves are of adequate size. Use a pair of scissors to cut the spinach leaves off so as to not damage the plant from pulling them off. 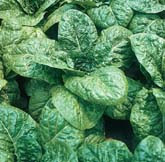 Spinach is a great crop because after you harvest some leaves, they will keep producing. Production of your spinach will slow down or stop once the weather becomes too hot, which also makes spinach a great fall crop as well. Rotates well with all vegetable varieties except for legumes. Companions great with cabbage, celery, lettuce, radish and onions, but not with potatoes. I can’t promise you that consuming spinach will make you big and strong like Popeye, but I can tell you it is very easy to grow, and fresh spinach is loaded with many vitamins, minerals and nutrients your body needs. This weekend I will be starting my broccoli seeds indoors. Like a baseball fan who gets excited to hear when pitchers and catchers are reporting to spring training, I get excited when I see plant varieties that are ready to start indoors pop up on my Droid smartphone calendar. Of course on my calendar it shows me when to start them indoors and then when to move them to the outdoors. We’ll save how to do that for a future article and podcast. For now let’s concentrate on growing broccoli in the home vegetable garden. Although broccoli seeds germinate best at soil temperatures in the eighty degree Fahrenheit range (twenty-seven degrees Celsius), they grow best in cooler temperatures where the soil temperature is sixty to sixty-five degrees Fahrenheit (sixteen to eighteen degrees Celsius). This makes broccoli a perfect candidate to start indoors, and then move outdoors while the temperatures may be a bit cooler. You will need to check a frost zone map for your area to find out when the last frost is estimated. You can get a free frost zone map from our website by clicking the “downloads” tab or obtain one from the USDA.gov website. From that date subtract six to eight weeks, and get your seeds going indoors. For best results, use a humidity dome (or some other similar structure) to create a constant warm temperature for the seeds to germinate. Keep in mind broccoli loves nitrogen. Hopefully you have been preparing the spot where your broccoli will go with heavy doses of compost. This will give your broccoli the nutrients it needs to survive and thrive. When planting your broccoli seeds make sure they are not planted any deeper than a quarter of an inch. Any deeper and the seeds simply won’t generate enough energy to push through the soil. Under optimal conditions broccoli seeds can germinate in as little as four days, however the standard is anywhere from seven to ten. When your broccoli is ready to be moved to the outside give them plenty of room to grow and give their roots ample room to expand. Sixteen inches apart should be the minimum, but twenty-four inches would be ideal. You can also stagger the planting between rows to maximize space. Many varieties of broccoli will tolerate light shade but do best in full sun. So if possible grow them in an area that receives a full day’s worth of the sun’s golden rays and give your plants an even, moderate watering every other day. Invest in a water tester. For a few bucks you can get an accurate reading as to when it is time to water your plants. It is time to harvest your broccoli when the head is dark green. Simply use a knife to cut off the head of the broccoli. 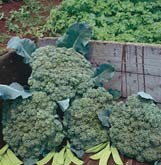 After the main head has been harvested, broccoli will still produce for a few more weeks. So keep an eye on it. If you see any signs of yellow on the heads that means that the plant has been over ripened (so to speak). As a side note of some additional information for advanced home vegetable gardeners out there, broccoli loves the soil’s pH to be between 6.5 and 7.5, rotates well with pretty much anything except members of the cabbage family, and companions well with many varieties of beans, beets, carrots, celery and tomatoes. I recently wrote an article about the importance of beneficial insects for your home vegetable garden. Beneficial insects are vital for healthy, productive gardens. Not only do they help with the pollination process, but they also ward off harmful insects by making them their prey. The more beneficial insects you have in your home vegetable garden, the less likely you will need to use some kind of pesticide to rid yourself of the harmful ones. Unfortunately just because you have a few aphids floating around does not necessarily mean that a swarm of ladybugs are headed your way. You have to attract beneficial insects to your home vegetable garden and then give them a reason to stay. Beyond a food source, even beneficial insects need a home. You can give them that and more by adding some flowers to your home vegetable garden. 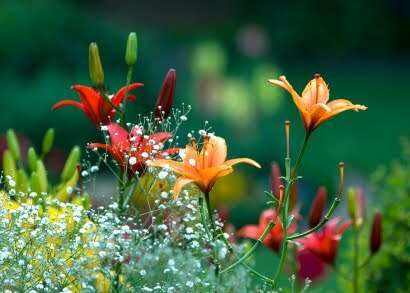 Besides being simply nice to look at, flowers create an environment that is appealing to the beneficial insects you need to attract. Here aer five you should consider when adding flowers to your home vegetable garden. This plant is a great source for attracting a number of hovering flies and ladybugs. Stick with an annual, vining species, because as a perennial it could get overgrown. Morning glory is available at most home and garden centers for a few bucks. Goldenrods are a genus of about 100 different species of flowers in the Asteraceae family. Stick with an annual species that would be considered native to your area. Remember if the plant is native to your area, it is more likely to attract beneficials. Also in the Asteraceae family, Yarrow works well to attract ladybugs, hoverflies and parasitic wasps. Not only is it good for attracting beneficials, but Yarrow has been shown to help combat soil erosion since it is resistant to drought. A genus comprised of anywhere from 100 to 200 species of flowering plants, they can be annual or perennial flowers and even, although rarely, small shrubs. They help with attracting parasitic wasps which are great for eliminating a lot of destructive worm species, i.e. tomato horn worm, corn earworm etc. 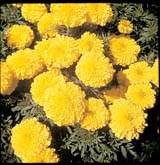 In the genus Tagetes, they are mostly annual but in some areas can be perennial. They do a great job in attracting butterflies and bees which aid in pollination as well as various hoverflies. An added bonus of marigolds is the secretion produced by roots has been shown to attack root eating nematodes. Adding flowers to your home vegetable garden opens up a whole new world. These are just 5 of the hundreds you can choose from. Just remember to plant flowers that are native to your area, your local co-op can help you with this and plant annuals, especially if you rotate your vegetable crop. We’re all used to growing things to eat in our vegetable garden, but browse the produce section of a high-end grocery in the right season and you’ll see some other things we don’t always think of as edible: Flowers. What’s more is that they are horribly expensive for a reason – they don’t keep or transport well but they do make a stunning impact on a dinner salad. That’s why they often show up on summer salads in restaurants. Abandon economics and think of practicality. You can make your flower garden do double duty. Your flower garden can yield gorgeous salad accouterments. Plant some nasturtium, dianthus, pansies and calendula. All will add color and a beautiful flavor to a salad. Chamomile makes great tea and has an almost apple-like flavor, Day Lilly blossoms taste almost like asparagus. They also are very durable, meaning you can stuff them with cheese, batter and fry. Top-setting onions are fascinating to watch grow and quite attractive. Broccoli will grow to good size in your flower garden. After a couple cuttings, let it bolt. The yellow flowers will add an interesting texture. Johnny jump ups have a mellow, minty flavor. Arugula and radish can add interest to your flower garden as well. Many a restaurant kitchen, especially those of the modern “keep it local” ethos, has an herb garden outback. In recent years, as we understand fresh is better, those gardens are often moved out front next to the parking lot or walk, letting diners know they are in for a real treat. Treat your flower soil the same as your vegetable soil. Stay away from chemicals. Organic matter matters most, whether from your home compost, rotted manure from a farm or compost from municipal brush grindings. A word of caution: Always be certain you know exactly what you have planted and what you are eating. A simple mistake, like not knowing daffodils or floral sweet peas are toxic, can have dire consequences. Attract Insects to keep your Garden Insect Free? A couple of the biggest myths of organic gardening is that it is hard work and time consuming.. While both might be true, neither term applies to anything you have to do. Let me explain. Part of organic gardening is being able to keep bad insects, such as aphids, beetles and armyworms, off of your plants with good insects also called beneficial insects, such as ladybugs, hoverflies and lacewings. The only work you need to do is to attract the beneficial insects. This requires some upfront work, but once that is done, the beneficial insects do the rest. You could even go the easy route and actually purchase beneficial insects from a local garden store, but for me that seems like a waste of money when you can simply attract them to your property yourself with very little effort. The hard work is performed by those beneficial insects you attract and as for the time consuming part that simply depends how much time you want to spend planting items that will attract these beneficials. There are a number of beneficial insects you can attract to your garden that will suffice in helping you get rid of those insects that do damage to your vegetable plants. Which ones you should attract really depend on what you are growing. For example, if you grow corn, your crop immediately becomes subjected to a possible attack by the corn earworm. As their name suggests they love to eat your corn. Not to worry though, bring in some Trichogramma wasps and the corn earworm will soon disappear. For each destructive insect, chances are there is a beneficial one that will eat it. When in doubt of a destructive insect’s beneficial counterpart, just bring in the old reliable praying mantid. Be careful about these guys though, they have tremendous appetites and they will also eat some beneficial insects as well. If you are like me and not an entomologist how do you know which beneficial to attract? My rule of thumb is to take the necessary steps to attract the ones that tackle the problem insects in my area. In my area aphids are a huge problem. So what I do is plant dill, fennel or cilantro along with some morning glory and in no time I increase the ladybug population who then consumes the aphids. I can write an entire novel on the insect population and how you can use insects to actually control the population by pitting one against another. It’s all part of the food chain. You are simply bring them together at the same spot. Just like with anything else, start off slow to get an understanding of you need to do to make this process work for you. Ask your local co-op in your area, they are filled with tons of information on this very subject. With a little prep work your garden can be insect free in no time. That’s bad insect free. Germination and development are critical phases for tomato seedlings. If you know what seed starting mistakes to avoid, you have an excellent chance to grow strong, healthy tomato plants to set out in your garden. Fungi and bacteria in non-sterile soil can lead to damping off. When seeds dampen off, they don’t germinate. When sprouted seedlings contract damping off, they thin at the soil line, flop over, and die. Do everything possible to prevent damping off organisms from infecting your tomato seed starting flats. Avoid using garden soil to start seedlings because it is packed with bacteria and fungi. Potting soil is not the best option for starting seeds, either, because it is heavy and too high in fertilizer. Sterile potting mix, either purchased or home made from peat moss, perlite, and vermiculite, is a better choice for planting tomato seeds. Soggy potting mix can lead to seed rot, which can mean no germination. No sprouting = no tomato seedlings = no plants. Keep your potting mix evenly moist. Maintain your room temperature between 70-80° F. Sustained cool temperatures can mean slow germination and slow growth. But be careful that the area is not too hot either, which can lead to leggy plants. Sometimes tomato seeds will germinate and grow well for a couple of weeks. But when they are a couple of inches tall, they may bend toward the light and look stringy. Avoid scraggly plants by providing adequate light. Make sure plants are in a sunny window with 12-16 hours of light a day or place them 1-3 inches beneath grow lights. The purpose of transplanting seedlings is to stimulate root development. Plants started in smaller containers (cell packs, peat pots, or seed trays) and then moved to 4-6 inch pots develop stronger root systems than plants which are not transplanted at all. When transplanting, it’s wise to submerge the exposed stem deeper into the soil, thereby supporting the plant, preventing legginess, and stimulating root growth along the buried stem. Seedlings that are not transplanted fail to develop as strong root systems. Transplant seedlings when plants have two full sets of leaves. Even when you start and grow healthy plants to set out in the garden, if you choose varieties that are inappropriate for your zone or for your gardening conditions, you may not harvest a quality crop. For instance, if you live in a cool, wet climate and start tomato varieties that do best in hot, dry areas, your crop may not produce high numbers or quality fruit. 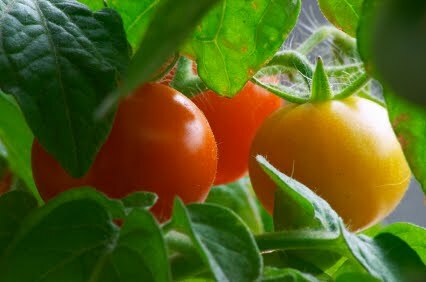 Or you may plan to grow container tomatoes, which require dwarf or tumbling varieties to do best. But the large garden varieties you started indoors won’t flourish in containers. Take time before you plant seeds to choose tomato varieties that are best for your situation. 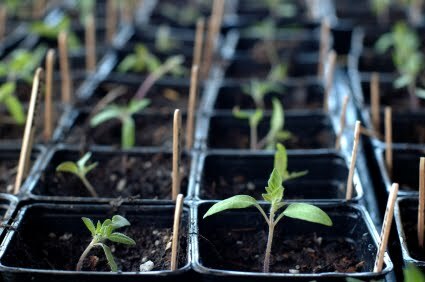 Then by carefully monitoring your tomato seedling crop, you can ensure a healthy, productive outcome this tomato season. Kathy Widenhouse is a contributing writer for Mike the Gardener Enterprises and owner of Tomato Dirt (www.tomatodirt.com), a leading source for information on growing tomatoes and using them. Which Potting Medium is Best for Starting Tomato Seeds? Choosing a potting medium wisely is an important step to take when growing tomatoes from seeds. The potting medium you select will be home to your tomato seedlings while they sprout and during their first few weeks of life. A potting medium’s main jobs are to get the seeds to sprout and to keep new plants disease-free. There are three kinds to choose from: garden soil, potting soil, and potting mix. When it comes to starting tomato seeds, garden soil (dug up from your outdoor patch) has three drawbacks: extra seeds, texture, and undesirable organisms. First, garden soil is full of weed seeds. Good sprouting conditions mean weed seeds will compete with tomato seeds for space, light, nutrients, and water. Moreover, garden soil’s texture is heavy. It compacts easily in small containers, which prevents good circulation and can choke seedlings. Worst of all, garden soil is crammed with bacteria and fungi, which are the main culprits in damping off disease. Damping off has claimed many tomato crops as soon as they sprout – or even before, by killing off the seeds. The best thing that can be said about garden soil as a seed starting medium is that it’s free. Check labels carefully when shopping for potting mediums at your local nursery or home improvement center. Note some are labeled “potting soil” and others are “potting mix” – a subtle difference on packaging, but a huge difference in content. In general, potting soil is heavier than potting mix. Content listings reveal additives like clay, sand, and compost. While these combinations are excellent for established plants, they are a less helpful environment for seeds and newly-sprouted seedlings. When potting soil compresses with planting and watering, there are fewer air pockets, which make it harder for seeds to sprout. In addition, most potting soils have a higher percentage of fertilizer than potting mixes. Tomato seedlings don’t need to be overfed. They acquire their initial nutrients from the seed. 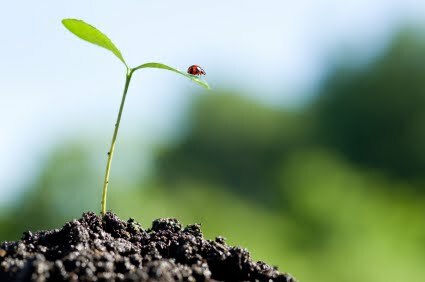 In fact, too many nutrients for brand-new seedlings can cause them to grow too tall and thin too fast. Potting mix is the best choice for starting tomato seeds. It is sterile, lightweight, holds water, and is low in fertilizer. Purchase commercially-prepared potting mix or make your own. A good prepared potting mix contains ingredients like sphagnum peat moss, vermiculite, and perlite. Sphagnum peat moss has anti-fungal properties that help keep seeds and seedlings disease-free. Vermiculite and perlite provide air pockets to keep the mixture light and allow circulation, while still retaining moisture. Whichever potting medium you choose, prepare it before planting seeds by adding warm water and stirring until the mixture is evenly damp. Press it lightly into your seed starting containers, plant tomato seeds, and get ready for a wonderful tomato crop. They are in the same family as the tomato and closely related to the cape gooseberry. They have the shape of a sphere and produce a green (sometimes green-purple) fruit and tomatillos are readily used in Mexican cuisine. Believe it or not they are easier to grow than you think and can be added to virtually anyone’s home vegetable garden. 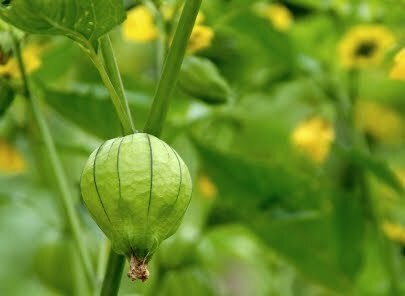 Just keep in mind that in order to have successful tomatillos in your home vegetable garden, you must grow at least two plants. Two or more grown close to each other will ensure proper pollination. Because they are in the same family as tomatoes, and if you have grown tomatoes before, the learning curve to grow tomatillos in your home vegetable garden will be small. Just like with tomatoes, you can start your seeds indoors about 7 weeks prior to the end range of your frost area as noted by the USDA frost zone map. For example in my area, zone 6, the range is March 30 to April 30. I will start 7 weeks from April 30. When planting your seeds indoors make sure the seed does not exceed ¼” in depth. The seeds are fairly small and if you put too much soil on top of them they may not generate the energy needed to push through. You can expect your seeds to germinate anywhere from 7 to 15 days. Using a humidity dome, cold frame etc, will definitely speed things up. Like tomatoes, tomatillos like the soil to be a bit more acidic, so try and get the pH range of your soil in the 6.0 to 7.0 area. Now would be a good time to invest in a pH soil tester if have not done so already. Tomatillos grow best when the temperature of the soil is around eighty degrees Fahrenheit. You can help warm the soil up by putting down a clear plastic tarp over the area and letting the sun do the rest of the work. When the day finally comes to move your tomatillos to the outdoors make sure you give them plenty of space. As a rule of thumb, stick with 3 feet from one plant to the next. This will give the plant and their roots plenty of room to grow, but at the same time be close enough for pollination purposes. Make sure the plants are in an area that receives full sun and don’t forget to give them a moderate watering. Every other day should suffice, unless you are experiencing periods of extreme heat. Then give them a daily watering, first thing in the morning just as the sun is rising. You will know it is time to pick a tomatillo because the outer layer, called the husk, will start to turn brown and/or split. Just use a pair of garden scissors to snip them off. For you advanced home vegetable gardeners out there who practice in crop rotations and companion plantings avoid following eggplants, potatoes,tomatoes and peppers in a rotation and stay away from pole beans, dill, fennel and potatoes in your companion plan. 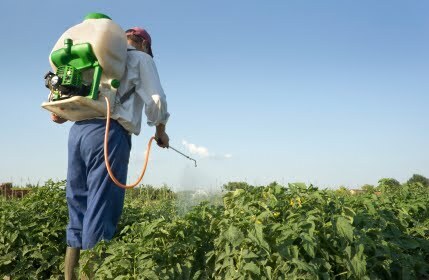 Too many times when we have a pest invasion in our garden, we reach for the chemicals. It’s an immediate reaction; I mean how can you not? The bugs often invade fast, and it’s the panic that gets you….back in the day that was my reaction too. Not now. Before you spray, do your research. Despite what most of the chemical pesticide, insecticide (etc.) companies tell you, it’s not the only answer. Over the years I have found sure fire ways that work just as well (maybe a little more effort is involved) and you don’t have to worry about chemicals on your crops. I have quite a few animals, and between gardening and them, I have been able to banish most chemicals from my property. I worry most about my 4 dogs, and if you have dogs yourself, read up on the chemicals you use; it is scary how most chemicals used just on lawns raise the lymphoma rate in dogs by 50%. Frightening, right? If you look to your organic remedies, even some of those aren’t safe for you to handle. That makes me uncomfortable. If it’s not safe for me to handle, I don’t want to spray it in my yard for my critters to come in contact with, no way. Like I said though, there are other options! Aphids for examples, regular spraying with a “weak” soap water solution will kill them in no time (2 tablespoons per gallon, but I use a little stronger solution). I prefer to use Dr. Bronner’s organic, free trade soap in peppermint or orange. This same mixture also works great on spider mites, which are prolific during the summer here (zone 9). It may have been made for people, but works great for the solution as well….not to mention it smells wonderful, and now worries about the mist….it’s all safe! Fungus gnats? Put out a bowl filled with apple cider vinegar mixed with a tiny bit of soap, or left over beer. They are attracted to fermentation/decomposition, and they drown in either solution. I use both in my home greenhouse. It will not wipe them out immediately, but much better than worrying about what is going to contaminate your food. Even better set a trap for them, they are attracted to wheat which acts as a good decoy plant. A great natural preventative is planting garlic (or a lot of other things in the onion family). I’ve planted it among a lot of different crops, and it seems to deter/greatly reduce the pests. For every rule there an exception though! We get black aphids during the cold weather which seem completely happy eating ANYTHING in the onion family. Just remember, think before you spray! With a little research, and a little extra effort you can ban the toxic chemicals forever! Good luck and happy gardening!